A recent “60 Minutes” segment essentially called the cleantech industry a failure, eliciting a flurry of criticisms defending the green technology sector. “Hoping to create innovation and jobs, [President Obama] committed north of $100 billion in loans, grants and tax breaks to cleantech. But instead of breakthroughs, the sector suffered a string of expensive tax-funded flops. 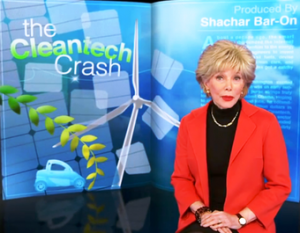 Suddenly cleantech was a dirty word,” said “60 Minutes'” host, Lesley Stahl. How is the cleantech industry faring, and what does its future look like? Should the government be involved in cleantech, and if so, how? My thoughts on the 60 Minutes segment just went up on my column at The Energy Collective. To summarize, though, I think the piece was wildly misleading by not providing any success story context to the list of public investment failures. It’s the latest example of how Washington (and the media apparently) have now concept that innovation breeds failures as well as successes. In fact, we want failures! And I think Vinod Khosla’s comments on failures in the VC world apply to government clean energy innovation investments as well (which are clearly needed). With that said, there is surely very real and important policy debates to be had as to whether public investments can be reformed to produce more innovation, better link research to market, and ensure they’re investing in a wide portfolio of risky energy technologies. But that debate requires nuance of which 60 Minute did not provide. “…the segment ignores serious clean tech policy debates that are worth taking a deeper dive into. For starters, the United States is truly in the middle of a clean tech crash, just not the kind CBS tries to advance. The U.S. clean energy innovation budget — the public investments in RD&D and smart deployment — has fallen 28 percent since the 2009-10 Stimulus Act. Federal clean energy research has dropped from $7.9 billion in 2010 to $5.6 billion today. Investments pegged for demonstration projects have dropped by an incredible 97 percent since the Stimulus. And many in Congress want to continue this trend with even deeper cuts. I have weighed in on this a few times already, but the bottom line message I tried to convey to Lesley Stahl is that it’s a complicated topic. There are successes and there are failures, but if you want to talk about failures it’s the nature of failure that’s important. I pointed out that as a taxpayer, I am not a venture capitalist. But in many cases — particularly in the advanced biofuel area — we have played venture capitalist with tax dollars when we shouldn’t have. That wasn’t a case of taking risk and failing. It was a case of taking stupid risks in some cases. A recent audit by the the US Department of Energy’s (DOE’s) Office of Inspector General was very critical of the money spent to try to build integrated biorefineries. We ended up with advanced biofuel mandates that were based on nothing more than wishful thinking. How could this happen? The wrong people were allowed to influence our energy policy. But as I stressed (but which didn’t come across due to the limited air time I got), this is a complex topic. There are lots of areas that are doing well. I pointed several of them out to Lesley Stahl. See the article I just published on the back story: 60 Minutes: The Rest of the Story. As someone who has been in energy and energy technology for some time, I don’t think Silicon Valley venture capital should have been in this sector in the first place. They have neither the cash, nor the bandwith nor the staying power for a sector as complex (and capital intensive) as energy. Cleantech and Silicon Valley was a marriage doomed from the start; not because there is not exciting stuff going on in energy technology, but the current VC model can’t handle it. Energy is too much money and too hard for your conventional venture capitalist. They were just chasing the latest buzz, without a clear idea of how to get from point A to point B. What cleantech needs is Bell Labs. Remember those guys? A skunk works funded by a regulated utility who invented the transistor. I sincerely doubt that a modern day Silicon Valley VC has the capability to introduce this kind of breakthrough (and is the kind that energy technology needs). Government money? A mixed bag. Incidentally, it is not as “free” as some people might think. In fact, the fees are quite stiff and the credit/investment criteria aren’t easy. Still, governments are not very good at technology commercialization. They are much better at basic research and “orphan” research — usually with a national security focus. The real problem is that everyone appears to be relying on venture capital to make things happen — like they have some kind of secret genius. They don’t and they can’t. Companies need to have substantial R&D commitments again (instead of relying on some one else to innovate for them). This is an economy-wide issue, but I think is particularly true for the energy sector. U.S. energy company R&D budgets are pitiful. What I found most striking about the 60 minutes piece was its ability to spend 20 minutes on the subject without mentioning the words climate change or any variant thereof (which is after all the real point). Totally separate from the wisdom of individual investments as already discussed in other comments, the idea that we’re expecting these new technologies to succeed financially in the short term without doing anything to address the underlying economic externality that essentially subsidizes fossil fuel prices, not to mention the actual subsidies going to fossil fuels, is simply unrealistic. Not only that, but we’re allowing the problem to actually get worse with such low natural gas prices. It’s actually amazing that the successful technologies are improving so quickly that they’ve been able to progress even in the face of these very substantial barriers. But the 60 minutes story didn’t even hint at these issues. The only thing surprising about the “60 Minutes” segment on Cleantech is that anyone should be surprised. As my book, U.S. Energy Policy and the Pursuit of Failure (Cambridge University Press 2013) shows, the U.S. government has attempted to aid the commercialization of various alternative energy technologies on and off for 40 years; in fact, if you include nuclear power, make that 60 years. But solar, wind, the PNGV supercar, and cellulosic biofuels have been at best niche products and more often conceptual as well as practical failures. All of the so-called alternative technology successes that some people point to, have been dependent on various forms of market-distorting government largesse. In fact, the U.S. government has never succeeded in creating a market winner that could survive without subsidies, tax preferences, and mandates—often all three of them together. The Obama administration (like other administrations, Republican as well as Democratic, before it) has had the belief that government intervention in markets is necessary to create technological winners—and that these winners will be transformative, upending old, dirty technologies, changing not just our way of life but our moral character as well. This idea was and is sheer arrogance. It is also ignorant of the way in which inventions and innovations succeed in the market (hint: it isn’t with government mandates). Those who criticize the “60 Minutes” segment argue that it left out all of the positive things that $150 billion of government Research, Development, and especially Deployment funding, has created including many wind farms and solar arrays. OK then. Those who think that there have been these great successes join me is advocating the end of RPS mandates, the end of the PTC for wind, the end of all the electric car benefits, the end of solar PV benefits, end the RFS which has been a disaster on so many levels, and the end of any special breaks for oil, gas, coal, and nuclear. Let the government fund R&D and, as for the ultimate consumer test, let the market decide. Strong opinions. Any comment on the Acid Rain program? It was a government market intervention (actually initiated by a Republican Administration) that very much dictated market behavior (similar to an RPS). In fact, it was the first Cap and Trade market. The government may well have a role to play in ameliorating externalities especially where the effects are local or regional, and success or failure is fairly straightforward to ascertain—as has been true with the Acid Rain cap-and-trade program. Also, the costs of such a program like that are borne mainly by ratepayers and shareholders, while the benefits are enjoyed by all citizens—in good Pigovian fashion. I assume that by making the analogy from the Clean Air Act to RPS mandates that you see RPS as a way to reduce CO2 to fight climate change. But there are a number of important differences between the SO2 problem and the CO2 issue. First, some RPS mandates specify that there should be x amount of solar and wind; IOUs in New Mexico, for example, have a 30 percent wind and a 20 percent solar generating requirement. Since these technologies have been subsidized in various ways by federal and often state governments, and often are bolstered with feed-in tariffs, the costs are borne in this case by ratepayers and taxpayers, and the main beneficiaries are the solar and wind industries. Second, it’s not at all clear that RPS mandates will reduce carbon emissions as much proponents claim. A 30 percent RPS will most likely not reduce emissions by 30 percent since back-up generation (sometimes as spinning reserve) is necessary because of solar and wind intermittency. A few critics have claimed there will be virtually no reduction unless back-up is hydro or nuclear. (Of course nuclear may be the best way to achieve carbon reductions without stressing the electric grid.) Finally, ultimate success or failure will be almost impossible to measure because CO2 is a global issue fraught with collective action problems. If New Mexico, to continue that example, were to successfully meet all its electricity RPS goals with renewables it is unlikely that it would measurably affect global CO2 or global temperatures. Still, if we were to have a national program to reduce carbon emissions, it would have to be based on pricing carbon in some way and, like the sulfur dioxide system, allowing firms to decide how to meet it. Certainly the current system, state RPS mandates and heavy subsidies for renewables, is not the answer. The 60 Minutes piece was nonsense, had poor research, no data, and anecdotal evidence. According to Bloomberg New Energy Finance (BNEF), while global clean energy investment (public and private) in 2012 totaled $268.7 billion, only $30.2 billion, or a little more than 11 percent, went to research and development. Wall Street Journal reporter Keith Johnson states, “The U.S. has the second-biggest electricity system in the world, accounting for about 20% of the entire world’s generation capacity. Wind power’s 5% of that pie is a big slice. The 60-odd gigawatts of wind power installed in the U.S. amounts to more electricity-generation capacity than in the entire country of Australia or Saudi Arabia, and as much as all of Mexico. It’s about half as much power as in France or Brazil.” Washington DC — According to the latest “Energy Infrastructure Update” report from the Federal Energy Regulatory Commission’s Office of Energy Projects, renewable energy sources (i.e., biomass, geothermal, solar, water, wind) accounted for 49.10% of all new domestic electrical generating capacity installed in the twelve months of 2012 for a total of 12,956 MW. By comparison, for the full 12 months of 2012, new natural gas generation in service totaled 8,746 MW (33.15%) followed by coal (4,510 MW – 17.09%), nuclear (125 MW – 0.47%), and oil (49 MW – 0.19%). And Mike Thiessen’s April 2013 article in Motley Fool, stated, ” In fact, several independent natural gas producers have filed for bankruptcy within the past few years, with several others indicating that such filings may be on the horizon. Since some of these producers are private firms, their insolvency declarations have been low-key affairs that attracted little attention outside of their immediate circles of employees and creditors; however, this trend may have lasting implications for investors in public gas producers as well. ” The clean tech industries are booming in spite of uneven and unfair federal policy treatment while conventional energy sources coal, nuclear, petroleum remain virtually untouched. The Union of Concerned Scientists a released February 2011 report “Nuclear Power: Still Not Viable Without Subsidies,” found that more than 30 subsidies have supported every stage of the nuclear fuel cycle, from uranium mining to long-term waste storage. Added together, these subsidies often have exceeded the average market price of the power produced. Citizens for Tax Justice in their 2011 report detailed that the oil pipeline industry secured at $24 billion in total tax subsidies between 2008 and 2010. But Todd Neeley DTN Staff Reporter compiled an oil subsidy list in 2010 dollars at $133.2 billion to $280.8 billion/annually/ .96 cents to $2.01 per gallon produced. The idea somehow that the good ole boys can receive taxpayer billions and billions of subsidies while targeted early support for yet-mature technologies, in yet-mature markets by small-to-mid size companies is somehow un-American. The price of all the renewable energy resources and energy efficiency is ramping downward and moving closer to grid parity. It’s time for Congress to zero out traditional energy subsidies first, and then rationally thereafter scale-down and then out the newer clean energy subsidies over the next 20 years. But to label cleantech investments a failure is not only absolutely not true, but I am amazed on cleanech’s market growth even with all the federal policy cards stacked against these industries. One quick comment not on the substance of the piece, because I have not seen it. I find it problematic to discuss wind and solar capacity as if it is apples to apples with other forms of generation. The traditional “nameplate” capacity figures that are usually used are, in my view misleading because they fail to reflect the episodic nature of these generation sources. They also do not reflect the current tendency (even greater in some countries which have an even higher percentage of these resources) to drive backup, usually fossil fuel based, generation. There are some elegant and robust ways through more ubiquitous demand response to make episodic renewable generation less dependent on on backup generation, and less prone to reducing system reliability, but development of those solutions is not advanced by gilding the lily on how much of all this new “capacity” is actually used. Didn’t 60 Minutes jump the shark with that Benghazi report anyway? I have not seen the 60 Minutes piece, and have no intention to (despite my fellow columnist Robert Rapier at Energy Trends Insider being featured) – energy stories in mainstream media are at best superficial, and more often misinformed. 99% of Americans don’t understand even fundamentals about the energy industry and the role that energy serves in allowing for an industrial or post-industrialized society. That we should expect a higher level of sophistication on the subject by media only reflects the over-confidence we show in some select media outlets (notwithstanding the small segment of the population that believes the media to be part of some vast conspiracy). Nearly all commentary on energy matters is driven by groups pursuing specific agendas, and while this may be true for may subjects, there really is no informed neutral voice to be the teacher that society needs on this subject. This is, of course, an extremely serious problem (and part of the reason platforms like Our Energy Policy are such important – albeit very small – steps in the right direction). We’re embarking on an enormous transition within the energy world, one that will reshape nearly everything we touch in some way. We need serious and responsible journalism and media that understands the subject who can make the various aspects of the energy world relevant and understandable. Voices that will teach and facilitate reasoned dialogue that can lead to responsible compromises.